Even for someone like me who takes great joy in meal planning and shopping, sometimes it’s nice to take a little break. I recently wrote reviews of two popular dinner kit delivery services: Blue Apron and Plated. 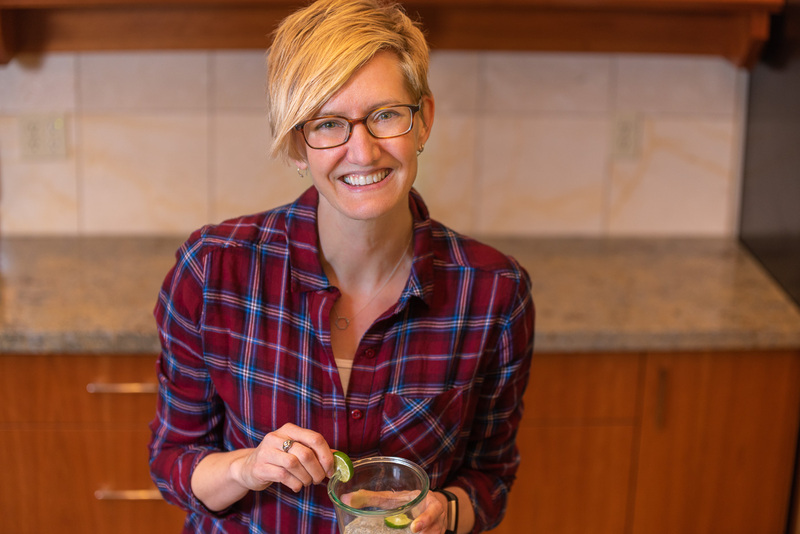 This is my third in that series, but this time I’m focusing on a local business trying to compete with the big national guys: Acme Farms + Kitchen. I first found out about them last year from a friend, long before I knew anyone would package up ingredients for you with recipes and such and mail them to your doorstep. (Talk about a revelation!) She is a devoted customer and her glowing description convinced me to give them a try. How it works: Like the other services, you place your order online. But in this case, all the ingredients are local, and once they’re packaged up they don’t have far to travel to get to my house. Acme will deliver to Bellingham or Seattle (and some spots in between) on Thursday, or you can save yourself the $5 delivery fee and pick it up at their headquarters. You don’t get to choose your menu but I actually really enjoy the surprise element of it all. Opening the box and reading through the meals is a highlight of my week! They select the recipes based on what’s available and in season. You can, however, choose different sized boxes and different eating styles, and they’re expanding their selections all the time. They’ve added a Basics Box (eggs, bread, fruit, and a dairy item) and an Ultimate Salad Kit in case you decide never to go to the grocery store again. The other two services now require subscriptions, but with Acme you can just buy when you want it. What it costs: We happily devoured two Small Vegetarian Locavore Boxes this fall and each had 4 meals/recipes. Cost per box was $59. Technically, they were supposed to be Bean and Cheese Burritos with Tomato Salad. But they ended up as soft tacos since our wrapping and rolling skills were subpar. How hard was it to cook? Pretty easy overall. The soups came together quickly and the Cottage Pie was a cinch. 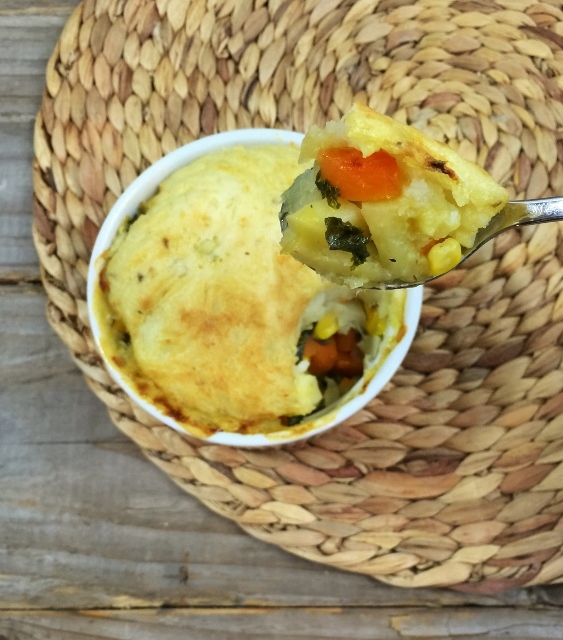 This particular recipe would be an easy one to adapt to whatever vegetables you had lying around. And normally, I wouldn’t choose to eat parsnips, but since they were buried in the Cottage Pie filling, I actually ate parsnips. I probably felt like the recipes were easy to cook because the meals from Acme were built around more familiar foods than with the other services. Most everybody knows how to cook quesadillas and boil pasta, so there was no intimidation factor. This might also make their meals a bit more family-friendly than Blue Apron and Plated…kids are used to seeing burritos on their plate, but maybe not Quinoa Tabbouleh with Fairy Tale Eggplants. How does it stack up nutritionally? Very well indeed. 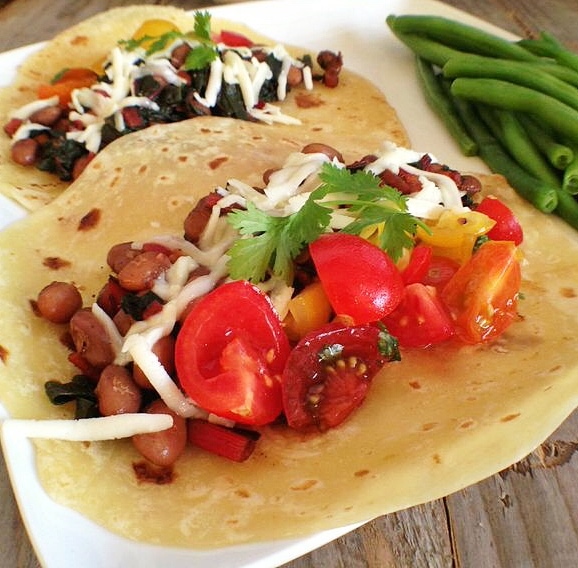 Finally, after sampling 10 vegetarian dinner kits from the competitors…we got legumes!!! And they were local, to boot! The pinto beans were from Haricot Farms and the split peas were from Palouse Brand, both based in Washington state. And I’m happy to report that the boxes were bursting with vegetables. This is one of the reasons I like these food delivery services and CSAs: once you get the good stuff in your house, you’re more likely to make it and eat it! 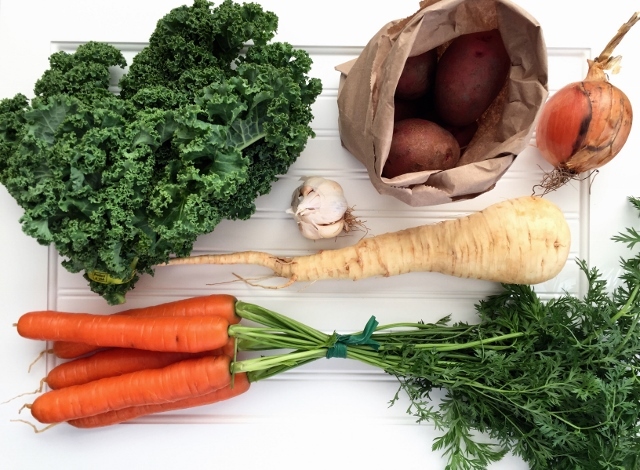 In our second box we got carrots, onion, parsnip, red potatoes, kale, broccoli, garlic, celery, Yukon potatoes, sweet peppers, and Swiss chard. And now I’m curious about what a January or February box might look like when produce is less plentiful. 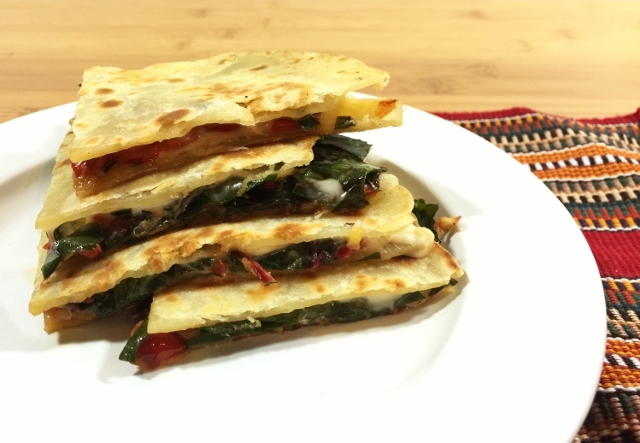 Also, I never would have thought of using chard in my quesadillas; that veggie idea is genius and definitely a keeper. Alongside all the produce was a fresh Breadfarm baguette, fresh Bellingham Pasta Co. penne, fresh Tadeo’s flour tortillas, local Mt. Townsend Creamery jack cheese, and pasture-raised eggs. Delightful. Pretty much everything I needed to make Cottage Pie, with a few exceptions. I used my own dried thyme, olive oil, butter, and cornstarch. I did notice two opportunities for improvement: the bread, pasta, and tortillas, while delicious, were not whole grain. But they were all freshly made, which is a step in the right direction from what we normally have in our pantry and fridge. Also, I would love to be able to look at nutrition information for the recipes. 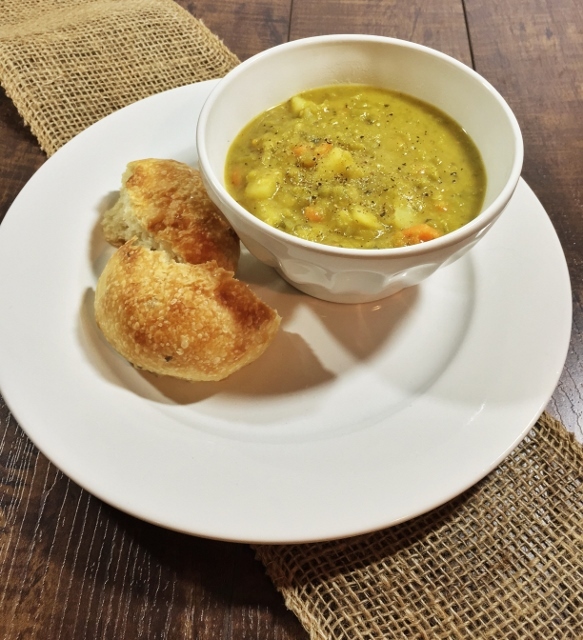 Other nutrition notes…I did cut down on the 1 tablespoon of salt called for in the Curried Zucchini Soup, and was still happy with the flavor. As vegetarian meals go, though, the soup was low on protein, and the addition of croutons and a side of beets didn’t boost that much. But on the plus side, from my quick assessment of the ingredients I believe it did have the benefit of being low calorie. Also, I did like that the instructions for cooking the quesadillas asked you to start with a dry skillet – there was no need for extra oil, or the extra fat and calories it would bring. Of the 8 total recipes over two weeks, 3 were vegan and 2 could be made vegan. But they don’t do an exclusively vegan box, so you’d often have eggs and cheese on hand that wouldn’t get used. How did it taste? The quesadillas were simply spectacular, and so were the burritos. The two recipes were similar, but so flavorful for such a simple preparation, and the texture of the homemade tortillas was fantastic. The Split Pea Soup came in third for awesomeness, followed closely by the very fresh tasting Penne Pesto. Now that’s a lot of basil. Pesto must be on the menu. The Cottage Pie was really good, and I ended up modifying the Kale and Potato Frittata a bit. Since I don’t like eggs, I sautéed the potato/kale filling with 1/2 can of garbanzo beans and some Parmesan for me, and Jeff followed the recipe as written for himself. We had a fruit salad on the side for a flavorful and nutritious meal. The Spaghetti with Broccoli Pesto was just OK.
Was there enough to eat? The recipes generally made 3 servings: 2 for dinner + 1 leftover. There were often no sides. We added tomato slices to the pesto pasta for color and served it with a side of edamame and carrots to bump up the protein somewhat. The Cottage Pie gave us 4 generous servings (We made it in 4 individual ramekins instead of 1 pie plate as instructed.) but we added homemade applesauce and sliced cheddar cheese as side dishes to round out the meal. With Acme we often had leftover ingredients too, which was never the case with Plated or Blue Apron. 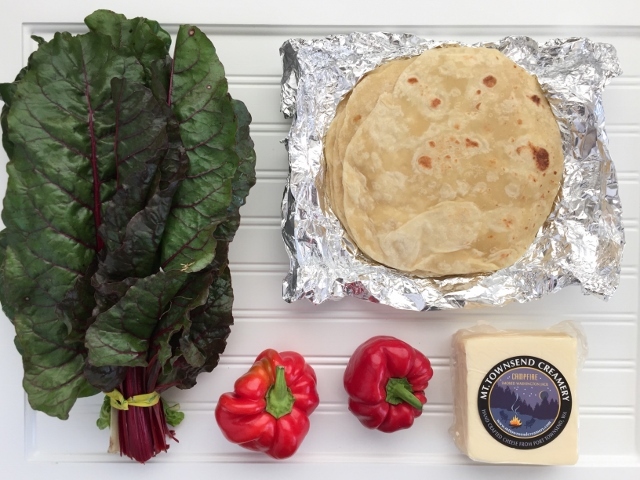 For example, we didn’t use the whole brick of cheese for the burritos or the whole bunch of chard for the quesadillas. 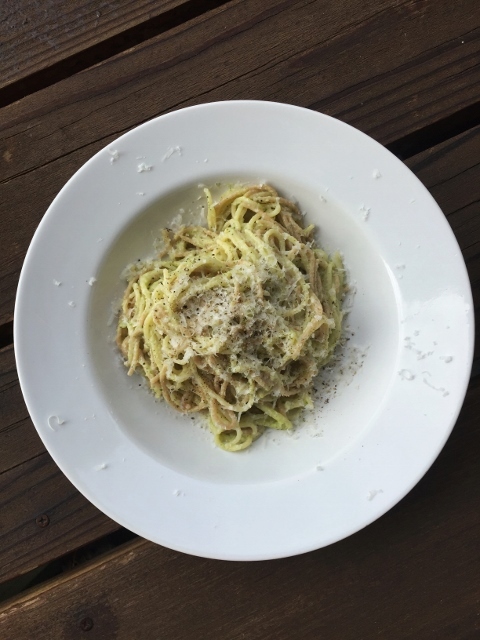 I only used half the pesto with the 12 oz. 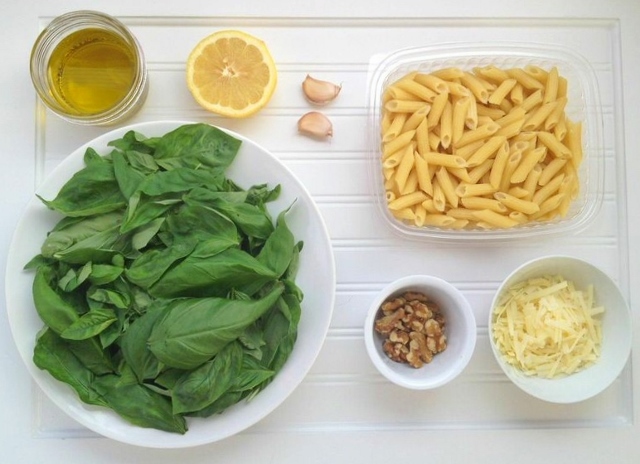 pasta to save calories and used the other half a week later. Sometimes there were even extras in the box. Week 2 we got jalapenos and carrots, even though they weren’t called for in any recipes. Bonus! In addition to the Q&A above, let’s look at some overall pros and cons. Acme had far less packaging by comparison. Like the others, the delivery came in a large cardboard box. But what was inside was starkly different. Plated and Blue Apron use multiple large ice packs, and every single ingredient comes in a plastic bag, plastic portion cup, or tiny plastic bottle. It’s a lotta plastic. For Acme, there was one piece of paper covering the stuff inside, the cheese and eggs came in a paper bag with a small ice pack, and there was one Trellis Earth produce bag full of basil. The pasta was in a biodegradable container, the tortillas were wrapped in foil and the baguette and potatoes came in their own small paper sacks. Most of the vegetables were just piled free and easy into the box, and I ended up using my own plastic baggies for a few of them before putting in the fridge. They list “pantry” items you’ll need in addition to what’s in the box to complete the recipes. 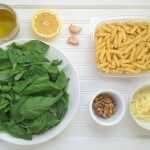 It’s usually simple stuff like olive oil, butter, lemon, walnuts, etc. This is pretty insignificant, but I loved the look of the brown craft paper they used for recipes and instructions. Acme doesn’t use the fancy food photography like the other services; in fact there are no photos at all but I didn’t miss them. Since the recipes were familiar foods, I was pretty sure what the final product should look like. It was by far the best price compared to the other services. Plated was about $15 per person, Blue Apron was $10, and Acme was $7.50, if you figure each meal/recipe was supposed to serve 2 people. I almost feel like recipes were printed in order of what you should make first for the week, and so on, considering the shelf life of the perishable ingredients. I can’t confirm that but SO COOL if it’s true. A clue that it might be: there are notes in some recipes to get you a step ahead for the next one, so I think their intention is that you’ll go in order. For example, Meal 2 instructs you to soak the pinto beans for Meal 4 after you’re done making the frittata. Meal 3 tells you to cook the beans, after you pull together the Curried Zucchini Soup, so they’ll be ready to eat the next night for the burritos. I’m oh so glad when someone else does the tough thinking for me. 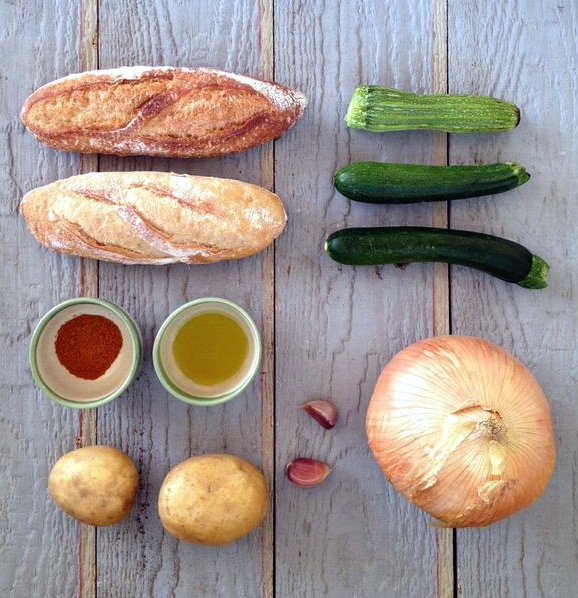 Ingredients for the Curried Zucchini Soup. Probably the most noticeable matter was the typos. I’m pretty sure they use the same recipes for each box but then modify them to be vegetarian, paleo, gluten-free, etc. So they must have to do a lot of editing and have multiple versions of the same instruction sheets. I am no stranger to typos in my own recipes, so I can sympathize, but this made for several unfortunate bloopers. My Cottage Pie recipe asked me to “pour meat mixture into a pie plate.” Also, our box for the first week contained no Parmesan cheese, and it wasn’t listed as a pantry item, but it was needed for 2 recipes. I was sad to see no fruit in my boxes, so it was the most common food group I added to our meals. I’m sure it had something to do with it being October, and I noticed that they do offer seasonal fruit in their Basics and Beyond Basics boxes. Overall, we were extremely happy with the process and the results. Of the three dinner kit services we tried, Acme is the only one I plan to use on a regular basis. It was yummy, reasonably priced, and just down the street from my house. 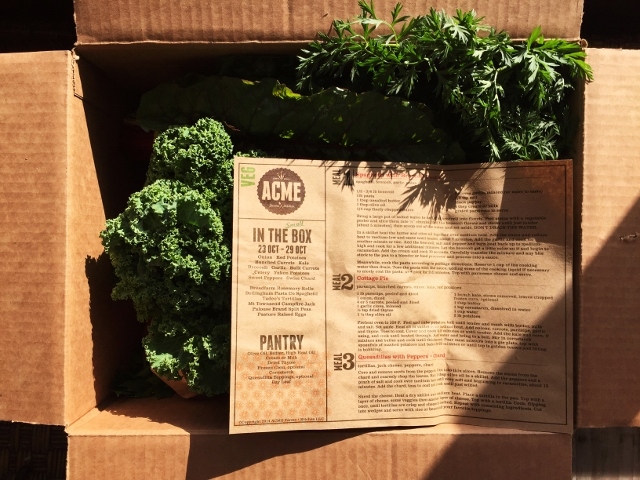 If you’re already eating healthfully but want a fun change-up for your regular routine, or if you’re thinking January 1st is a good time to start some new healthy habits, check out Acme Farms + Kitchen or see if you have a local company doing the same awesome thing in your city. Do you know of a company near you that’s trying to get local foods distributed to the locals? Thanks for the great review! I just went to check it out, and the small vegetarian locavore box now costs $75 for “3, sometimes 4” meals. So that makes this a little less attractive, but I’m still going to give it a shot! Hi Shan. Thanks so much for your comment. You made me curious, though, since that’s quite a jump in price. When I searched today I still see the Small Locavore Vegetarian Box at $59. (Pick up is free, but delivery adds $5, which would put it closer to $64.) Adding the gluten free option to the vegetarian box does add another $6, though. Maybe I’m missing something…I tried pasting in a screen capture of the pricing page I was looking at, but no luck. Either way, it’s super cool that you’re going to try it. If you have a chance, I’d love for you to come back and share your experience – I’d be so interested to know what you think after you give it a whirl. Ah, I’ve figured it out! The Seattle box costs more than the Whatcom County one. Curious to see if it’s worth it! Will definitely report back! I’ve been using Blue Apron for a few weeks and like it a lot, but like you said, the carbon footprint and lack of tofu, legumes, etc are big downsides. So — thanks again for the review! Oh, of course. That makes perfect sense! Thanks for figuring that out. (I didn’t want to be passing along incorrect information.) Hope your box is awesome and tasty! Can’t wait to hear about it. Wow!! We just saw your blog post review of our boxes! Thanks for taking the time to write this and for taking great pictures to tell the story. 🙂 We will share it on our FB page. Hi Joy. So glad you found the review. I certainly had fun cooking, eating and photographing everything. I really am so impressed with what you guys are doing. You’re making it easier for folks to eat well, which is impacting a lot of families for the better. Keep up the good work! Just tried these guys and got the paleo box. I was blown away. I know you’re vegetarian – but the amount of organic meat was phenomenal. So much so, that I still have 3 lbs of burgers in the freezer and leftover pulled pork that I can’t even get to this week. Tons and tons of amazing fresh produce and eve a dozen eggs. Amazing recipes. Minimal shopping this week because we just have so much food. Can’t wait to try out the locavore and basics box for my dairy and wheat eating boys. Awesome, Elisa. I’m so glad you tried them out and were happy with your food!